I was so excited back in March when I discovered Mexican Shrimp Cocktail. It was such a thrill to stumble across a clean-eating, low-calorie fast food that I really enjoyed. Well, it got even better this weekend when I tried my first Mexican Mixed Seafood Cocktail. My BF and I were on our way back to town after a fun day of off-roading when we grabbed lunch at a hole-in-the-wall Mexican place en route. Imagine my delight when I saw this exotic seafood blend on the menu! 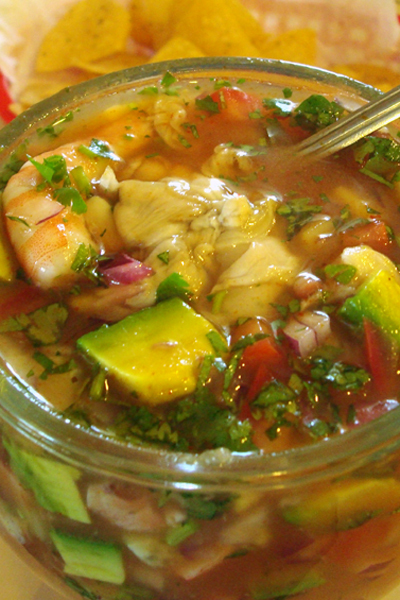 The ‘Campechana’, described in English as “cocktail mixed”, was made with shrimp, octopus, abalone and oysters with chopped red onions, tomatoes, cilantro, cucumbers, avocado and cocktail juice. It was delicious! It was a refreshing and filling meal, perfect after a hot day on the dusty trail, and it was totally in keeping with my diet plan, providing lots of quality protein and other nutrients while still satisfying my tastebuds. Exciting!